Now you can create a movie quality cat face for Halloween or theatre (especially Cats!) with this cat face application from Woochie. Use this appliance for creating costumes for the cast of cats, for a realistic finishing touch to your cat costume, or for creating Hermione Granger as a cat from “Harry Potter and the Chamber of Secrets”. 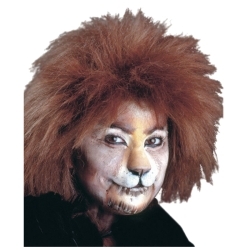 The cat nose application is available in a small or large size and requires spirit gum to apply. Woochie prosthetics fit as no thick edged, scissor trimmed product can. They feature paper thin edges or an invisible net base for the smoothest blend onto the skin. They offer the best shaped, lightest, most flexible and most comfortable prostheses available on the market today. Don't forget the Castor Sealer to prepare you appliance to accept cream makeup and extend the life of the prosthetic.